Borrowed from French stéthoscope, a word coined by its inventor, physician René Laennec, equivalent to stetho- +‎ -scope. (transitive) To auscultate, or examine, with a stethoscope. The stethoscope (from Greek στηθοσκόπιο, of στήθος, stéthos - chest and σκοπή, skopé - examination) is an acoustic medical device for auscultation, or listening to the internal sounds of an animal body. It is often used to listen to lung and heart sounds. It is also used to listen to intestines and blood flow in arteries and veins. In combination with a sphygmomanometer, it is commonly used for measurements of blood pressure. 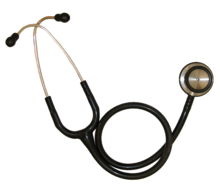 Less commonly, "mechanic's stethoscopes" are used to listen to internal sounds made by machines, such as diagnosing a malfunctioning automobile engine by listening to the sounds of its internal parts. Stethoscopes can also be used to check scientific vacuum chambers for leaks, and for various other small-scale acoustic monitoring tasks. A stethoscope that intensifies auscultatory sounds is called phonendoscope.